Jamie Dimon has said many notable things over the years, from calling a multibillion dollar trading loss "a complete tempest in a teapot" to answering a critical analyst's doubts by explaining, "That's why I'm richer than you." The JPMorgan Chase (JPM) CEO made news again Tuesday, while delivering the keynote address at the 2013 Annual Greater Louisville Inc. meeting. According to Chris Otts of The Courier-Journal, Dimon told his audience that the United States has "too much inequality." This isn't a novel insight -- the Occupy Wall Street protests were predicated on this idea, expressed through the slogan "we are the 99 percent" -- but it's striking to hear it coming from Wall Street's most outspoken defender of financial elites. "It doesn't mean we blame the successful," Dimon continued, sounding more characteristic, "but it's true. You want to have problems in society? Have inequality." Dimon mentioned "struggling inner-city public schools" in particular, Otts reports. 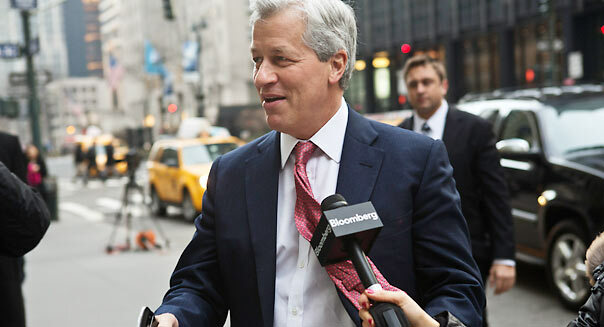 The statements represent a slight rhetorical softening for Dimon, who has in the past rejected the anti-banker sentiment that arose after the financial crisis of 2008. "Acting like everyone who's been successful is bad and because you're rich you're bad, I don't understand it," he said in late 2011 at an investors' conference in New York. Since then, a lot has changed for JPMorgan: the bank, seen as the most successful of the financial behemoths during the crisis, was recently the subject of a "riveting and devastating" Senate panel report that accused Dimon and other executives of hiding trading losses from investors and regulators. According to The New York Times, a criminal investigation of this affair -- known popularly, after the trader who caused the losses, as "the London Whale" -- is "at an advanced stage." Those days of public favor are over. Particularly damning is a report by Johsua Rosner, a longtime chronicler of Wall Street malfeasance, succinctly entitled "JPMorgan Chase: Out of Control." The blog Naked Capitalism called it "astonishing"; as one reads the report, writer David Dayen averred, "it's hard to see the bank as anything but a criminal racket just days away form imploding, were it not propped up by implicit bailout guarantees and light-touch regulators." All of this might have been on Dimon's mind when he gave Tuesday's keynote, adopting a tone more in line with the concerns of ordinary Americans, while not exactly abandoning his defensive stance regarding "success". What Dimon has yet to do, at least publicly, is acknowledge the connection between anger at the banks and dismay at the consequences of inequality: namely, that public subsidy of financial institutions -- which, according to Bloomberg, consumes about three cents of every tax dollar collected -- diverts resources that might otherwise be applied toward socially useful ends. For instance, funding those struggling inner-city schools.